We may like the notion that our business, brand, product, service, or idea is so great that it can stand alone, but the truth is that none of these things can develop, grow, or be successful by themselves. You need people. Partners, collaborators, builders, relationships, and connections. Every successful brand/business rallies behind their people. It takes designers to make your product or service come to life. It takes workers to make sure it is delivered to the market and that it lives up to its promise. It takes customers to buy it and give their feedback to you so you can further improve upon it. It takes a team of passionate people who are committed to the project to make an idea happen. 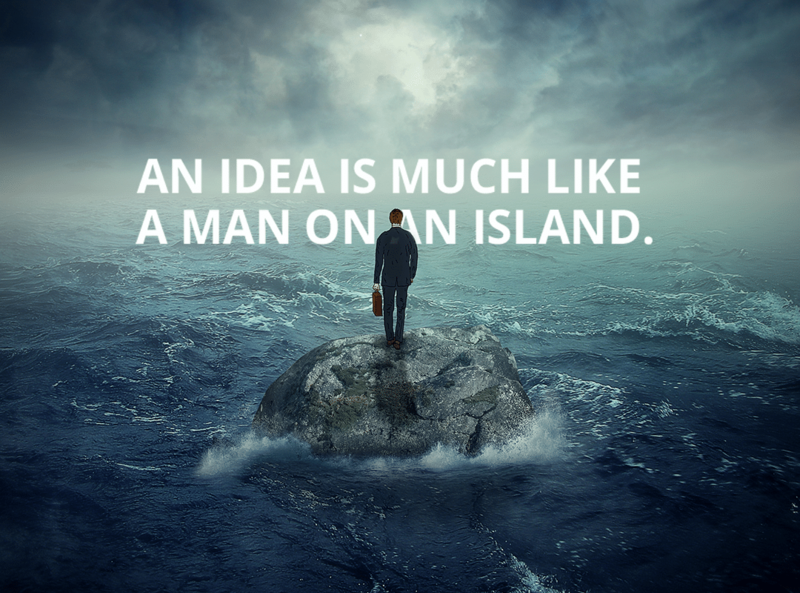 No one man can execute an idea to its fullest potential solely. Welcome to the ocean. We’re all in it. Big fish, small fish, all together in one eco-system. In an ocean where collaboration and creation co-function, who we work with and rely on can determine how far our ideas can go. Well, being a Wyoming marketing firm, we can tell you working closely and partnering with businesses has taught us much about developing successful brands. Here’s some insight into what we know. We know you have to clearly and simply communicate your brand’s values both in words and in vision. Your team must define your idea, it’s values, its goals, and its story together before it sees the light of day. How does your product/service impact peoples lives? Does it enrich their lives out of necessity or is it a luxury? And why should people care? With so many options in today’s market, you must be authentic and cut through the noise about who you are, and how you fit into peoples lives. It takes more than one man to accomplish this. We know that good design sells. In 2005 a group called The Design Council studied 63 portfolios of companies that traded Financial Times Stock Exchange over the course of a decade. What they learned is that the companies that put their focus on great design did better than the ones that didn’t. The companies that brought on staff for design or hired that part out as a collaboration increased their team and saw direct benefits from it. It takes more than the product/service itself to push the idea. We know you must appeal to the right market. In some cases, you may have started a business that reaches out to a demographic that you are not. How could you possibly know anything about the Millennials when you are yourself not one? You couldn’t possibly understand their need for co-op workspaces, beanbag chairs, and an insatiable need to consume products that not only define them but make a difference in the world while also being low impact on the environment. I’m teasing of course, but seriously if your business is going to flourish you better get yourself a team of collaborators to help you develop your idea for this demographic. By enlisting the help of good people who also understand the market you want to be in and are able to further develop your idea and help you grow. We know that the go-it-alone strategy will only produce a very narrow vision of what the initial idea could have been. Reaching out to other businesses and forming partnerships fosters growth and development for everyone involved. If ideas have the power to change us, shape our societies, and the way we live, then any idea that goes unfulfilled or unexecuted at it’s highest potential is a loss to us all.